Happy Towel Day! 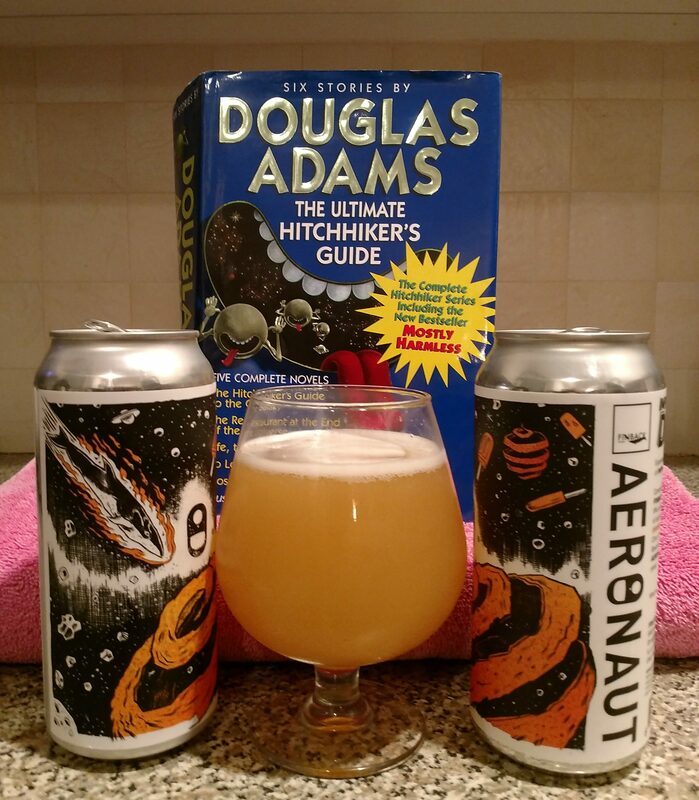 To those that may not be aware, May 25 is Towel Day, a day set aside to celebrate the life and work of English author Douglas Adams, best known for writing The Hitchhiker’s Guide to the Galaxy. After somehow missing Star Wars day this year, I was determined not to miss this one as well. I wasn’t sure at first how I would celebrate, but fortunately my favorite bottle shop was there to pick me up. Description: An IPA brewed with lactose and infused with orange zest and vanilla bean. It also features some pretty awesome can art paying tribute to the book, most notably a certain free-falling whale hoping to make friends with the ground. Appearance: Poured a cloudy, straw-yellow body topped by a layer of thick white foam that stuck around for the duration of the beer and left lacing along the glass. Smell: Orange juice, mixed with a slight bit of cream on the ending. 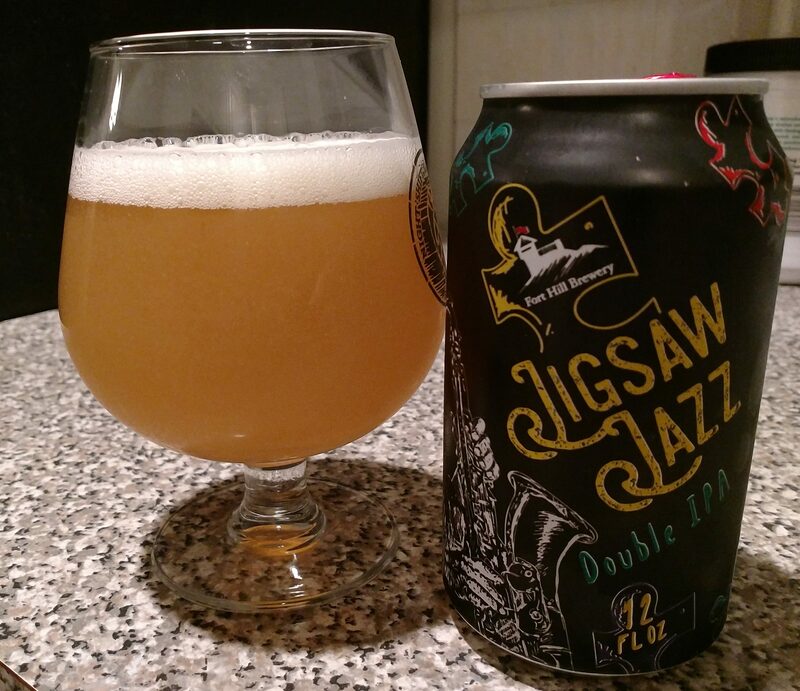 Taste: Orange juice upfront, followed by citrus zest and sweet cream with hints vanilla lurking in the background with a very mild grassy bitterness. Think orange creamsicle with a touch of vanilla on the end. Mouthfeel: It had a super creamy, medium-plus body with a slightly less than moderate carbonation. Hype: Elevated somewhat since this was a collaboration effort between two popular breweries, but not to the point where this was too difficult to get my hands on at the store. Personally, my excitement level was quite high, and that would have been the case with or without Towel Day being a factor. Overall: What an interesting beer! Definitely a bit out of the ordinary, but that seems appropriate given what it’s paying tribute to. I liked this a lot and had fun drinking it while looking up some of my favorite quotes from the book. I always welcome the chance to pick up something new from Brewmaster Jack. Careful readers of the blog may be tempted to read deeper into the name of this beer, but I assure you, it’s just another brew. Appearance: Hazy golden orange body with a thin white head of foam. Smell: Tropical fruits mixed with a touch of spicy pine resin on end. Taste: Not entirely unlike hopped juice. Light tropical fruit upfront blended smoothly into a hazy bitter finish that brought on tangy orange and grapefruit mixed with bitterness from a combination of piney, spicy, and earthy hops. Mouthfeel: Fluffy, medium body with light carbonation. Hype: None that I can attest to. I found these cans hanging out with the rest of the store’s new arrivals, but I didn’t know these came in as well until I got there. Overall: Fairly mellow and super smooth, I really enjoyed this one. It packed a lot of flavor and was an excellent example of the style. I’ve been really enjoying this brewery lately. Their combination of outstanding brews and cool can art has definitely gotten my attention. It also helps that my favorite bottle shop gets frequent deliveries of their stuff and seems just as excited about that as I am. Description: Listed on the brewery’s website as a juicy, tropical session IPA brewed with “new age” hops from the Pacific Northwest and New Zealand. Appearance: Poured to a hazy, golden/orange juice colored body topped off by a fluffy white head of foam. Smell: Tropical fruits with a pine and grapefruit bitterness on end. Taste: Light tropical fruit upfront mixed with pale malt. The finish brought on a mix of bitter grapefruit, tangy orange, and a dry crackery presence. Mouthfeel: Medium bodied with a slightly elevated level of carbonation. Happy little bubbles were especially apparent at beginning and end of the sip. Hype: As mentioned in the intro, I had expectations of my own for this one, but I don’t think there was any general hype around this. Overall: Very tasty, but maybe a bit overpowered as this little session IPA packed quite a punch on the finish. I’m probably still looking to pick some more of this up when the warm weather returns for good though. 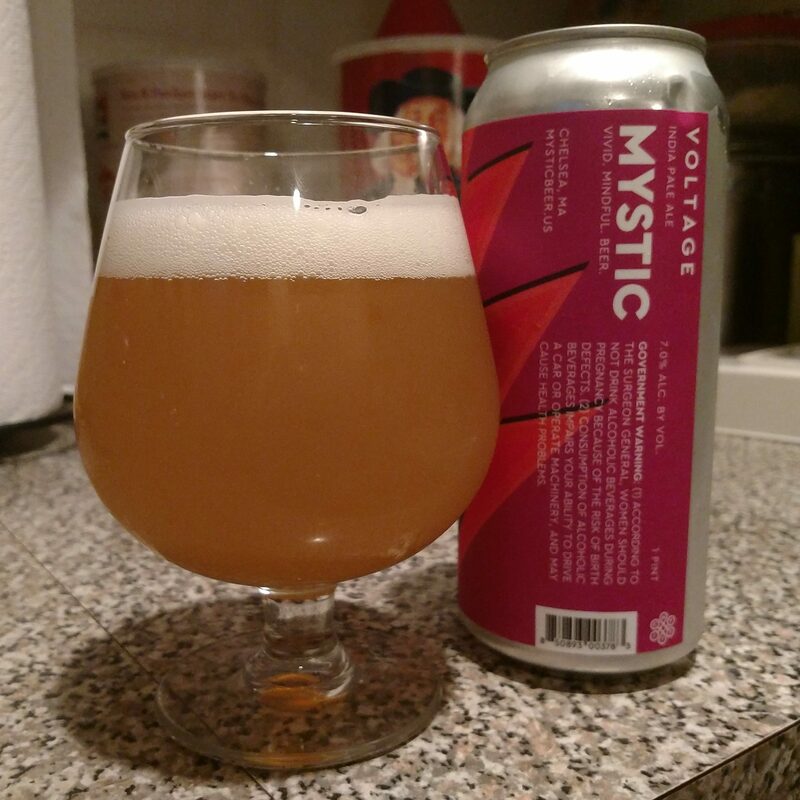 I think I’ve mentioned this on here before, but I’ve had a long standing goal to try out more beers from Mystic Brewery. Imagine my surprise them when I read that they are planning to expand into my current home city of Malden! Seems like a good time to get acquainted with what they have to offer. Description: An IPA brewed with Citra, Santiam, and Perle hops. My can was about two weeks old when I opened it up. Appearance: Poured to a cloudy golden yellowish-orange body with a layer of thick layer of white foam up top. Smell: Tropical fruits with a bitter piney haze in background. Taste: Mix of tropical and citrus fruit upfront with maybe some strawberries thrown in for good measure. 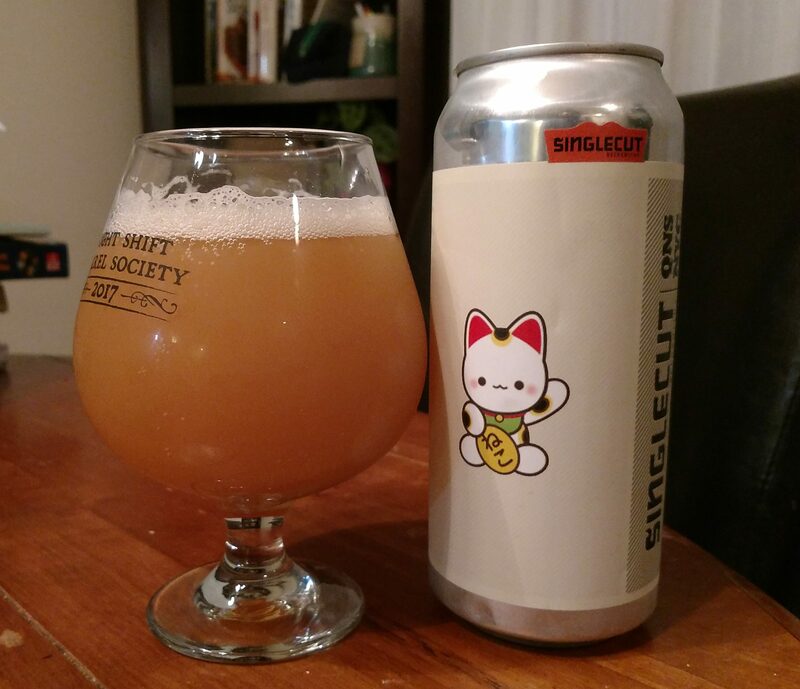 The sweetness carried through to the end where it was joined by bitter haze of piney, grassy, and slightly spicy hops. Mouthfeel: Creamy medium-plus body with a moderate amount of carbonation. Hype: This beer seems to be making a name for itself in the area and is a popular seller at the bottle shops I keep tabs on by my office in downtown Boston. Overall: I really liked this and would rate it as a superlative example of the style. With its great flavor and mouthfeel, I would put this up against of any of its more hyped competition. As the father of a soon to be two-year old, I read a whole lot of children’s books on a daily basis. While I have never felt the compelling need to review any of these, this one was different and as soon as I found out that it was making the rounds at my son’s playgroup I knew what I had to do. I’m guessing most of you are aware that this story was written in response to a children’s book published by members of Michael Pence’s family about their pet bunny. Looking to call out the Vice President on his homophobic beliefs, the creators of this particular story have imagined said pet falling in love with another male bunny. This book has been featured prominently on Last Week Tonight with John Oliver and all proceeds from it benefit AIDS United and the Trevor Project, which provides suicide prevention services to LGBTQ youth. 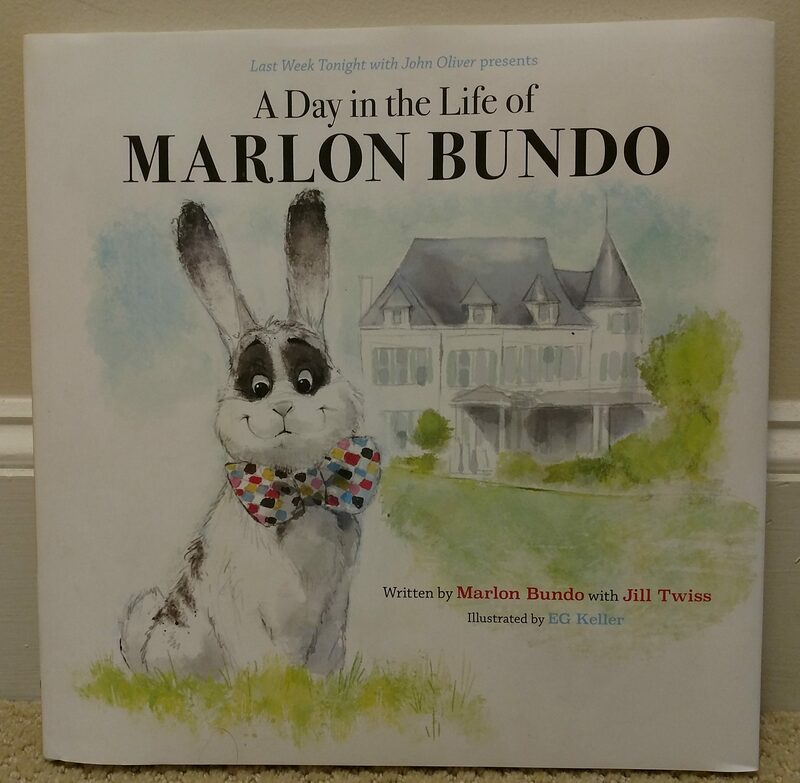 This is the story of an exceptional day in the life BOTUS (Bunny of the United States) Marlon Bundo, beloved family pet of Vice President Pence. Marlon’s day starts out like any other by watching the morning news with Bunderson Cooper, ignoring his boring grandfather, and hopping about the White House premises. Everything changes, however, when he spots a dashingly handsome boy bunny named Wesley and the two fall in love at first sight. Standing in the way of their happiness is President Stink Bug, an abrasive, boorish creature with a bad toupee that does not approve of their relationship. Fortunately, with the help of their animal friends and a timely civics lesson, Marlon and Wesley learn that it is okay to be different and are able to live happily ever after. I thought this was a cute, fun read that delivered an important and positive age appropriate message to children about embracing each other’s differences and the importance of our right to vote. Given the specific nature in which it parodies both Donald Trump and Michael Pence I don’t think this will age well enough to go down as an all-time classic children’s story, but it will put a smile on your face and I highly encourage giving it a read. So long as you’re predisposed to its political leanings you’ll enjoy it whether you have kids to read it with or not. I picked up this next beer on account of its cool can art and the zeal with which the owner of my new favorite bottle shop promotes it. 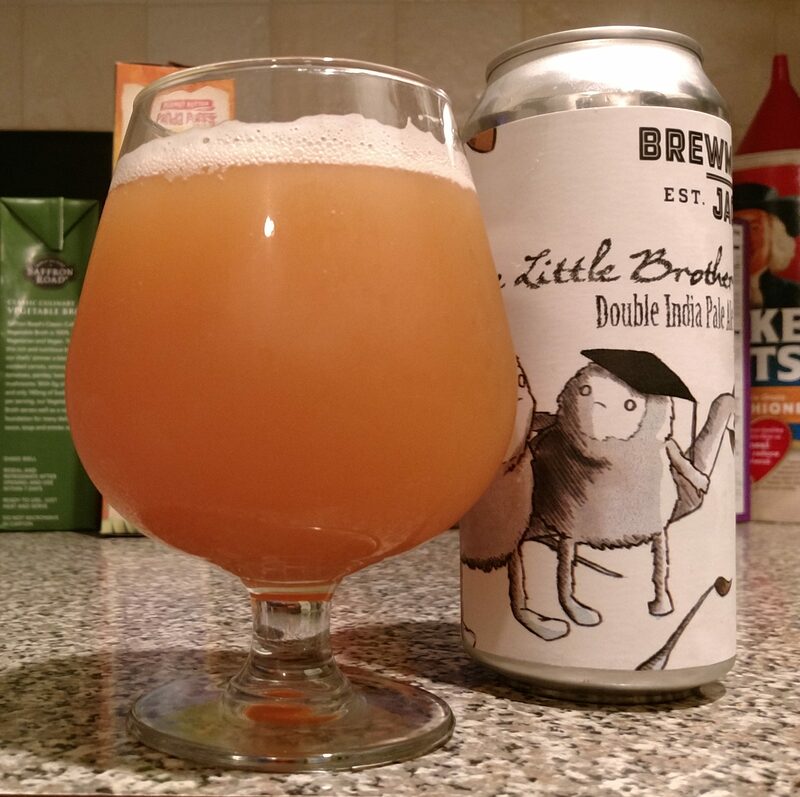 Description: Described on the brewery website as a bright and citrusy double IPA dry-hopped with Citra and brewed using Belgian-inspired techniques to limit sweetness. My can was undated but I want to say it was probably around a month/month and a half old. Appearance: Golden yellow body with a thin coating of thick white foam. Smell: Faint mixture of citrus fruit and pine. Taste: Subtle blend of citrus and tropical fruits upfront that leaned more towards citrus. Finish was a bitter yet subdued piney/peppery blend of hops. Mouthfeel: Creamy and smooth with a medium-plus body and roughly moderate carbonation. Hype: I’d heard some good things about this beer beyond just the bottle shop posts, so I was pretty interested to see how the beer would turn out. Overall: Overall this was a pretty good beer, but what really stood out to me was how smooth and easy drinking it was despite the elevated ABV. That said, I did feel it was perhaps a bit understated in some of its flavors. I understand that not all beers need to rock your taste buds, but this one I felt had a bit more it could have offered. 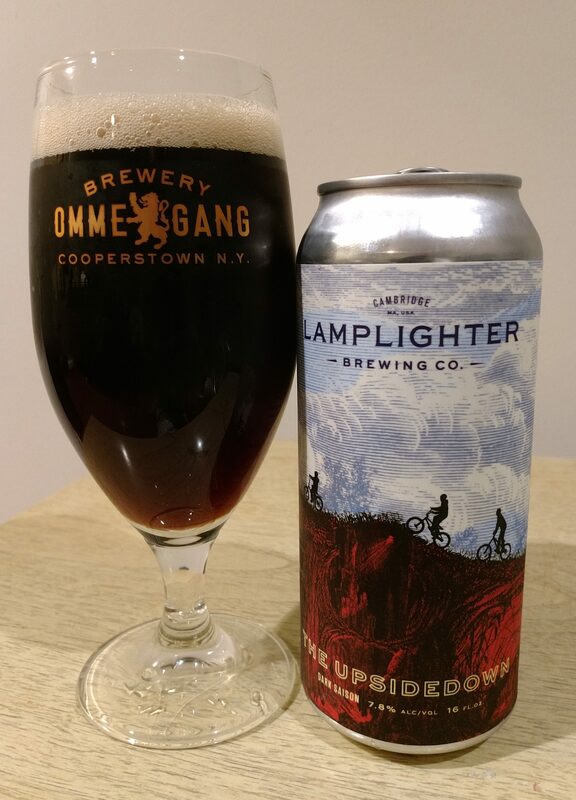 Would love to try this again from a can I know more about. Still worth the pickup if you come across it. I don’t recall the exact price point, but I do know that was very competitive for the style.